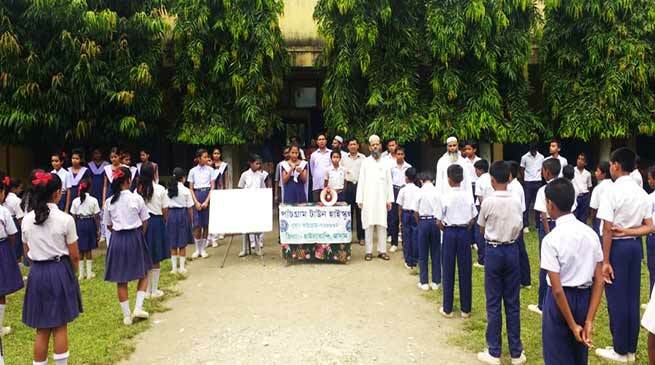 The 125th anniversary of Swami Vivekananda’s iconic 1893 Chicago address at the World Parliament of Religions is being observed across schools in Hailakandi district. At Panchgram Town High School, it was observed in a befitting manner on Friday. In the morning assembly session, the original English audio speech of Swamiji’s monumental speech was played in front of the large students-teachers gathering and subsequently Bengali version was read out by assistant teacher, M. Ali. Some famous quotes of Swamiji was narrated by teachers MH Barbhuiya and MA Laskar. In the afternoon, painting and essay competitions was held to spread the word of Swamiji in which students participated with energy and enthusiasm. AC Girls’ Higher Secondary School also observed the 125th anniversary of Swamiji’s iconic address on Saturday. Assistant teacher, PC Dey highlighted Swamiji’s address on India’s religious tolerance, spiritual traditions and his denouncing narrow-mindedness and fanaticism. He said Swamiji’s epoch-making speech at the World’s Parliament of Religions made the spiritual leader as messenger of Indian wisdom to the western world. Point by point, in a very lively way, Dey explained the significance of Indian religion, the legacy of India, our rich culture and Indian philosophy. Swamiji awakened the people of the country and built the self-confidence of India’s citizens, he opined. Inspector of Schools, Rajiv Kumar Jha disclosed that more and more schools will observe the 125th anniversary of Chicago address by Swami Vivekananda in the days ahead.